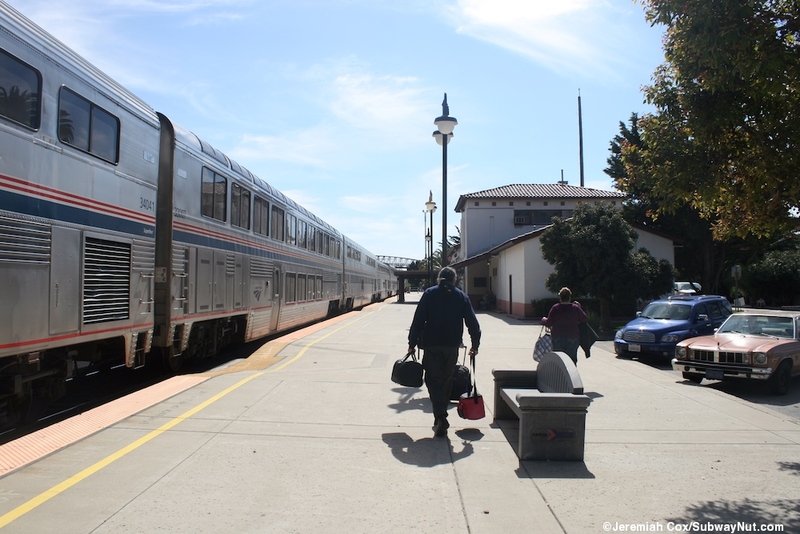 San Luis Obispo is the one major station stop on the Central Coast and where the crew changes on the Coast Starlight. 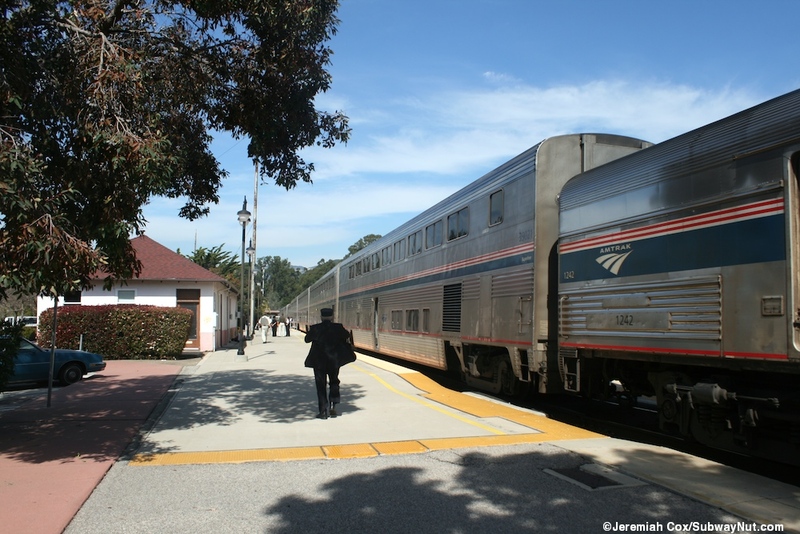 It is also the northern terminus of the two daily Central Coast Surfliner round-trips. One trip overnights at the station, and the other turns around (well their push-pull so no wyeing required) midday within a little over an hour layover. 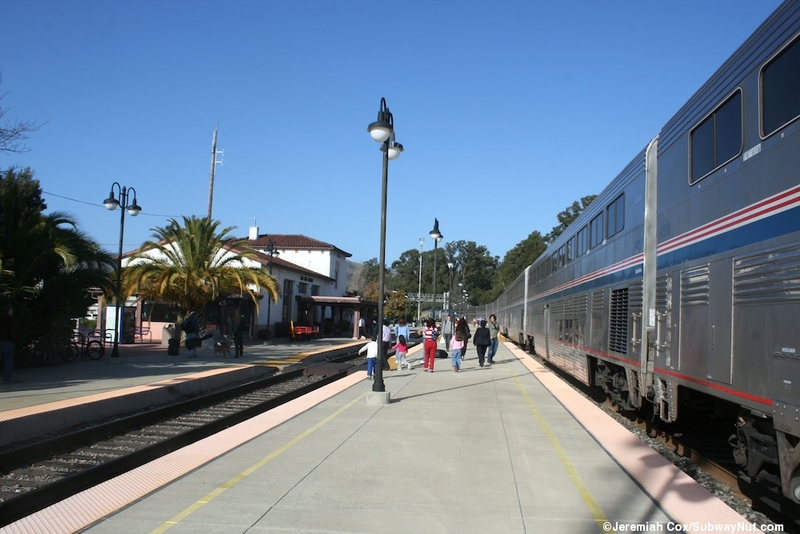 The Coast Starlights pass through the station at similar times with the northbound train, if running early having to wait for the southbound train to finish its station and servicing work. 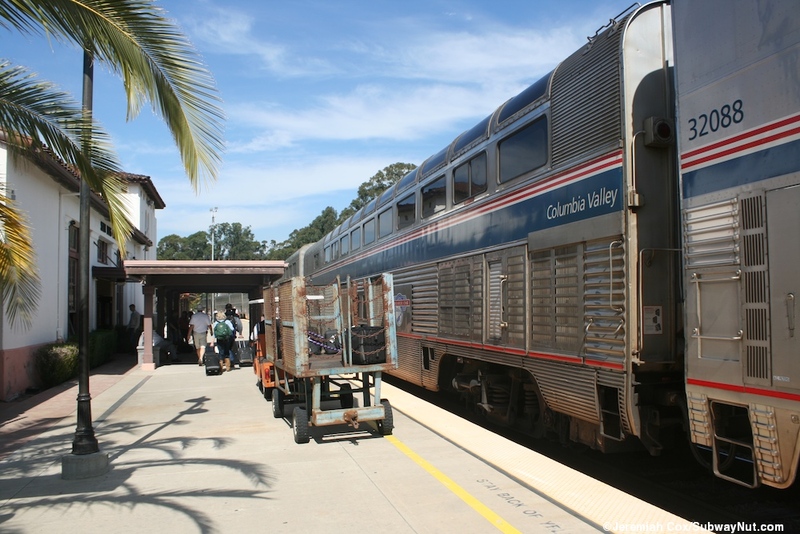 There are also many thruway bus connections that serves the station (and it is also an unstaffed Greyhound stop) to meet each of the 3 other daily northern Surfliner trips that terminate in Goleta (buses are actually from Santa Barbara, the second to last stop). 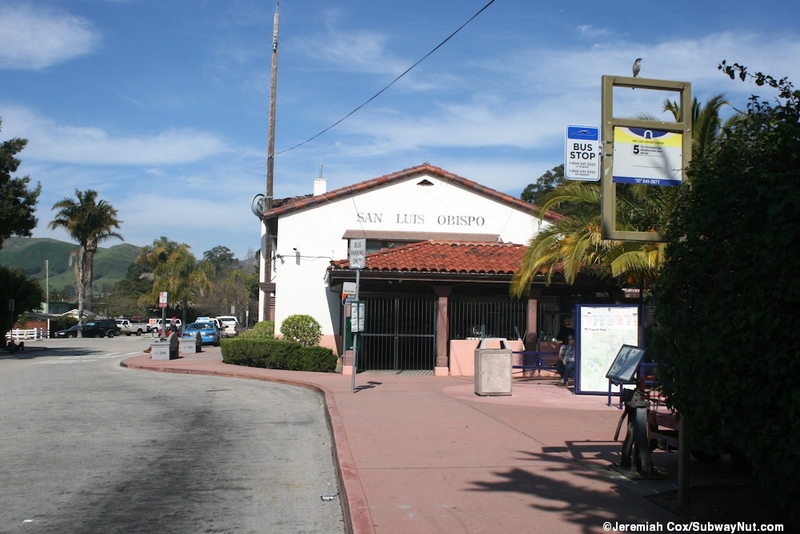 Five daily bus trips run north up to San Jose and provide connections to the Capitol Corridor. 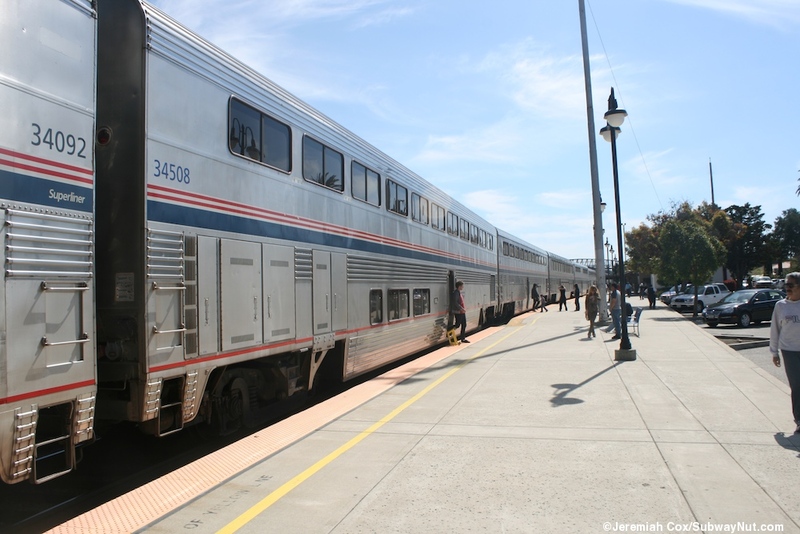 There are also two daily bus trips to Hanford and the San Joaquin. 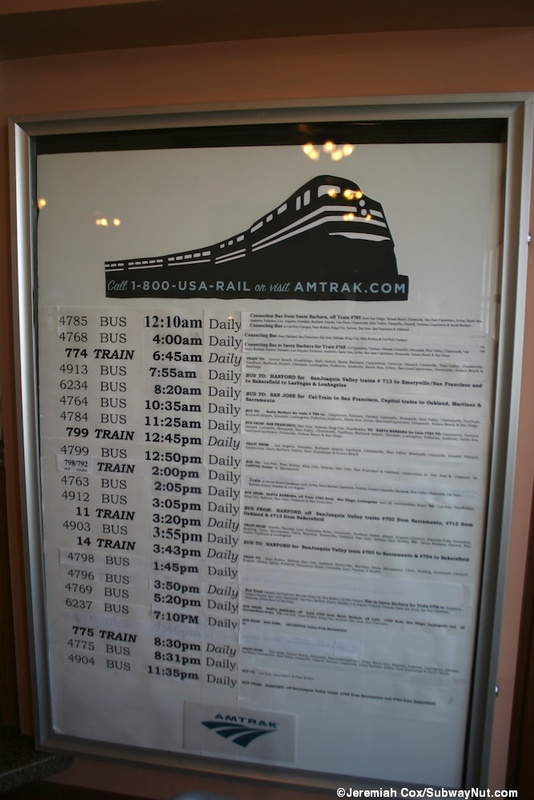 There is an information panel that looks like a collage displaying all of the stations different train and bus trips inside the station. 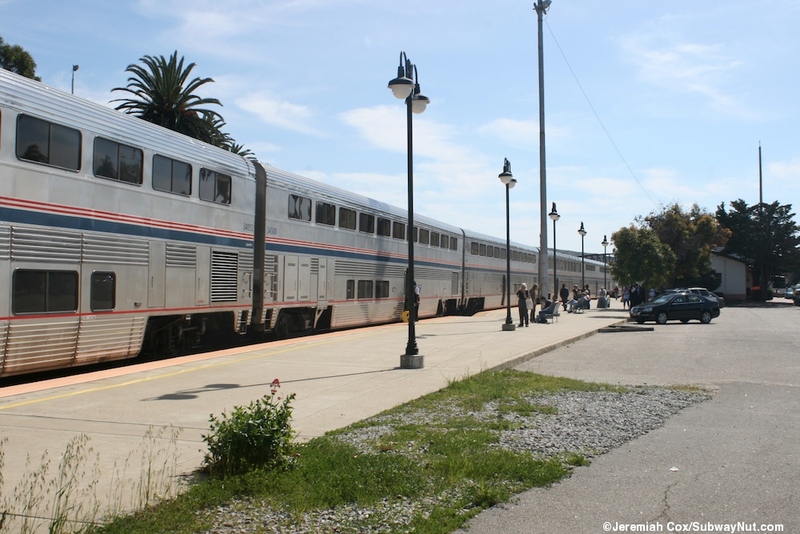 The stop has been served (and been the crew change point) for the Coast Starlight since Amtrak's founding. 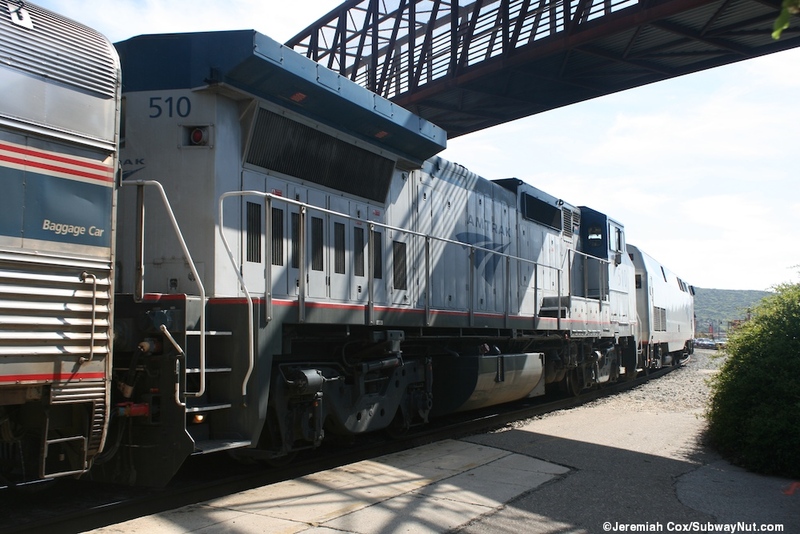 Minus the middle of the night 'Spirit of California' from 1981 to 1983 it took until 1995 for an additional train to reach the Central Coast when a San Diegan was extended north (these were all renamed the Surfliner in 2000 with their new bilevel rolling stock), the second midday round-trip was added (and I think it always uses the last single-level miss-mash of Amfleet and Horizon cars, not quite enough Surfliner cars were ordered) on November 17, 2004. 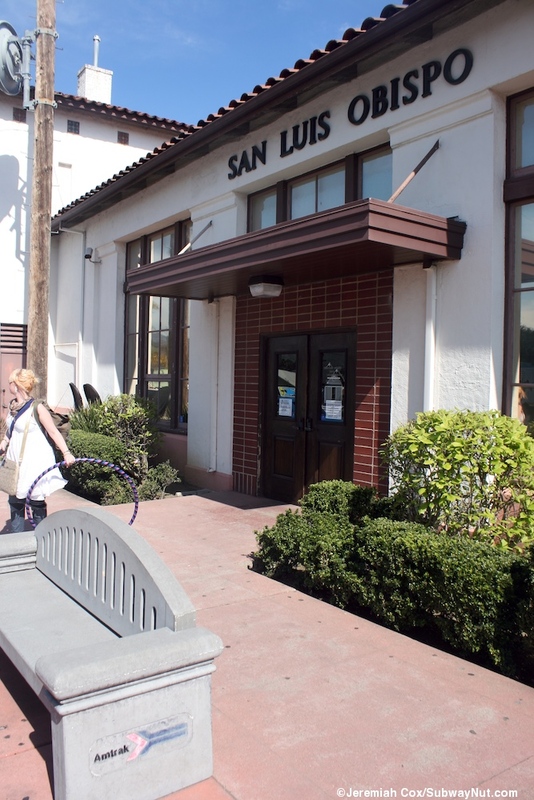 The station is a Spanish Colonial Revival building that was built in 1942. It is painted white with clay mission style roof. 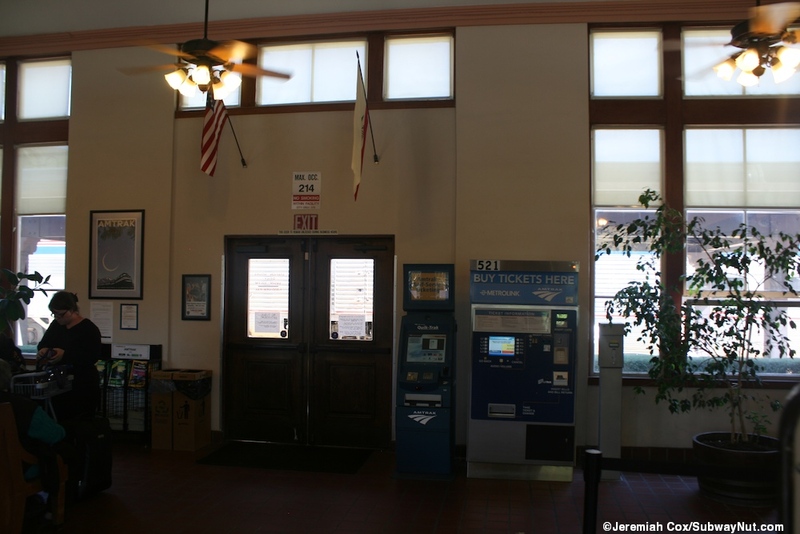 Inside is waiting room that can get crowded from the Surfliner's high ridership. All lighting is from lightbulbs within ceiling fans. 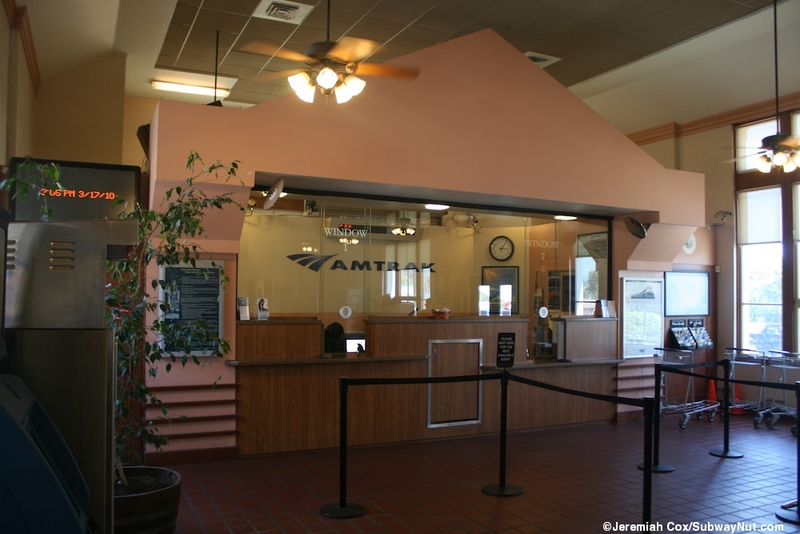 There is a two window ticket office (with one baggage scale in between) and all three daily trains get baggage service. There is also a single Quik-Trak machine and the most northern Metrolink Ticket Machine (these also issue Surfliner tickets). 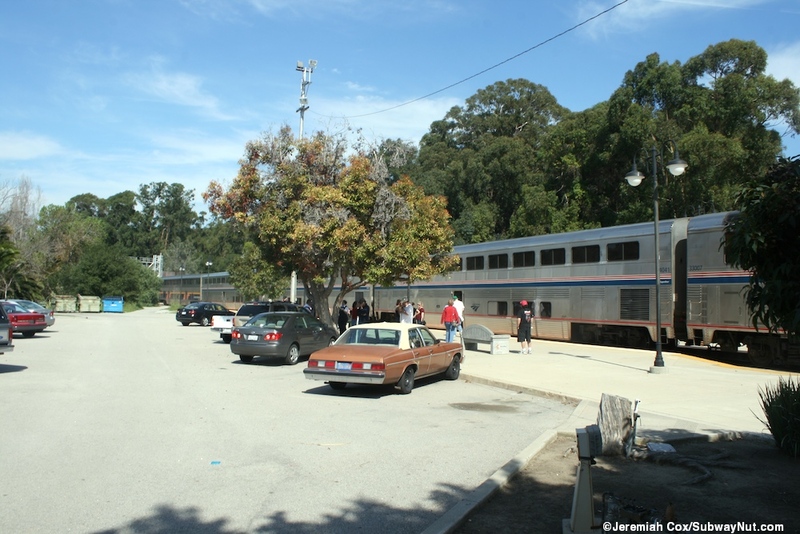 This depot is at the location where Santa Rosa Street curves to follow the train tracks. There are small parking lots, plus the bus stop right out front. 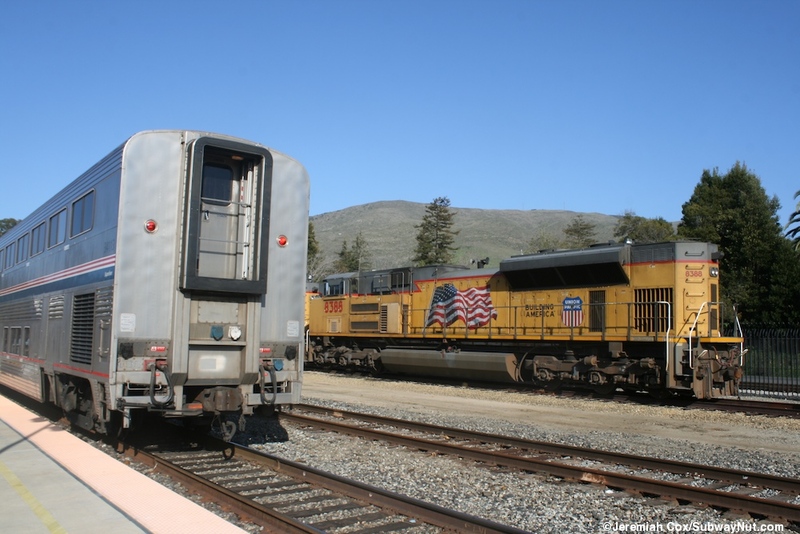 The depot leads out to two tracks that can platform, but only one train can be in the station at the same time. There is first a low-level side platform that the depot leads out to directly to the nearest track it has nine total pedestrian crossings to the an island platform for the next track, beyond it is another through track and than a separated small fenced off train yard with a few more tracks inside. 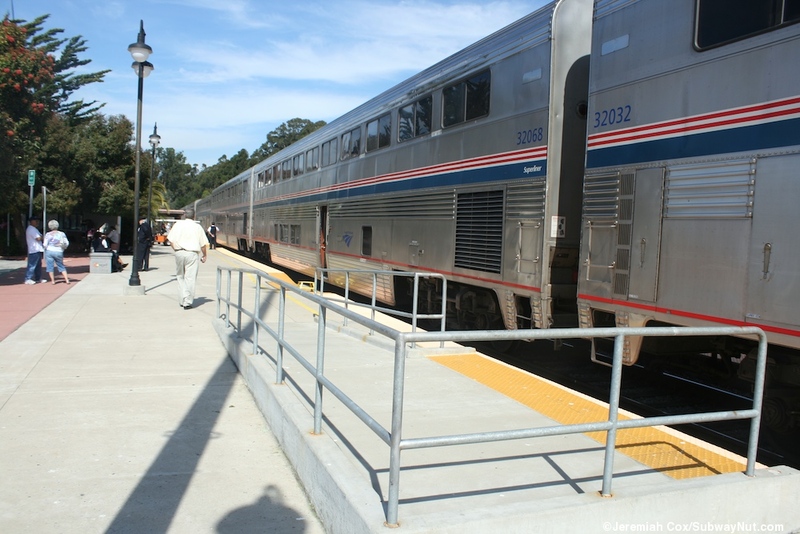 The platforms each have a line of black lampposts and the side platform has some concrete benches (with both the old Amtrak pointless arrow and Amtrak California's logo etched into them). The island paltform is lined with black boxes containing houses so a train can be watered at the station. 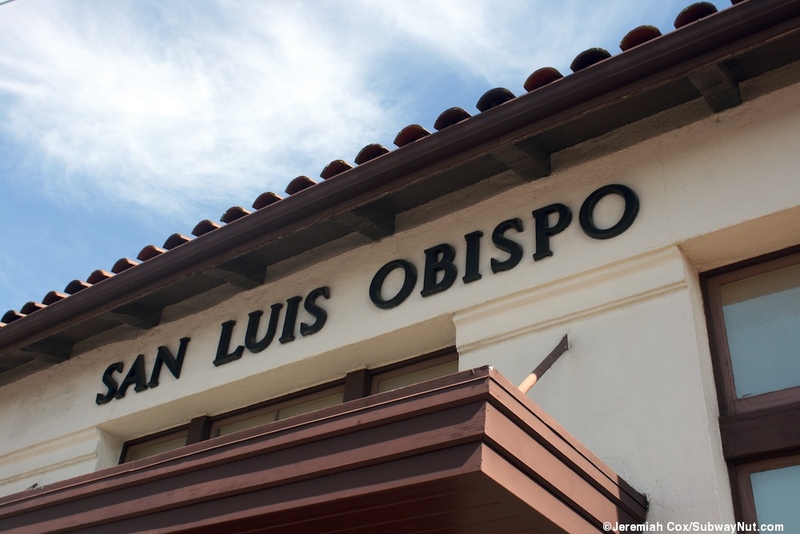 There is no signage at the station just San Luis Obispo lettering on the upper walls of the depot. There is a tiny canopied section on the side platform, existing only directly outside the depot. 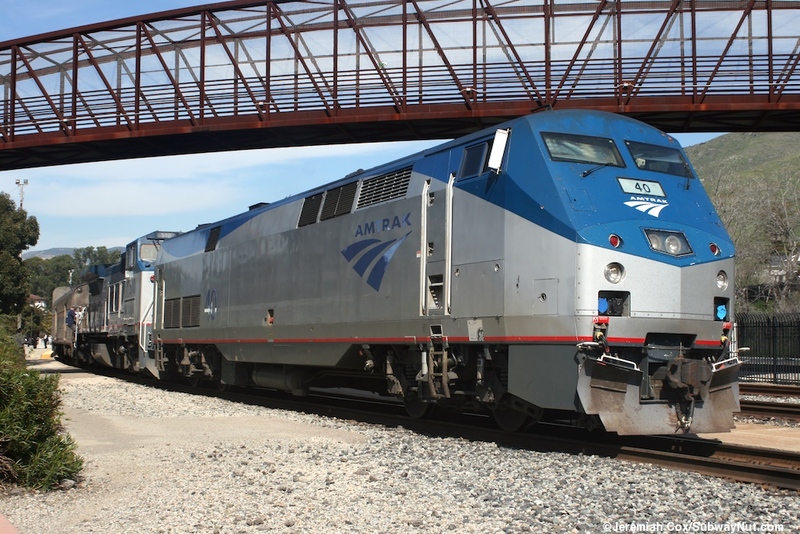 There is a second smaller building towards the southern end of the platforms, used by the Union Pacific Railroad where each also has a mini-high platform ramp for level boarding with a Bombardier Bilevel Commuter car, I guess. 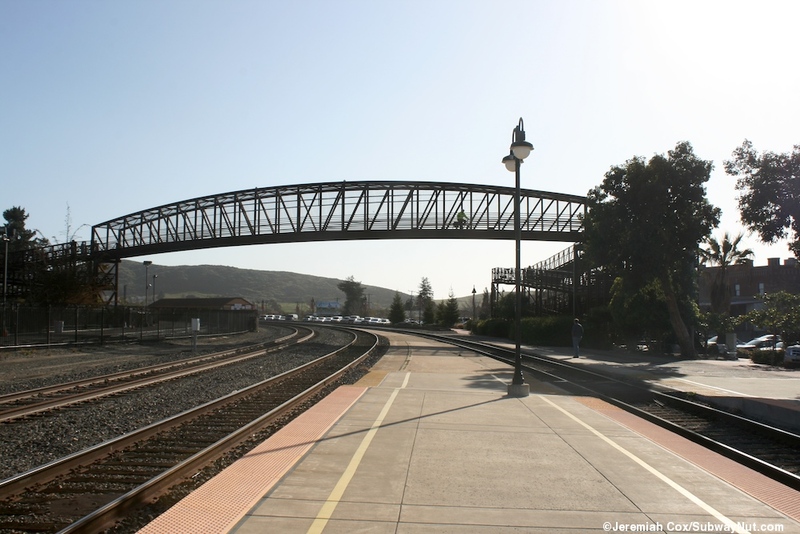 Beyond the southern end of the platforms a pedestrian bridge crosses the train line. South of here along the train line is also the 1894 Southern Pacific Freighthouse with the distinctive orange and brown SP Lines colors. 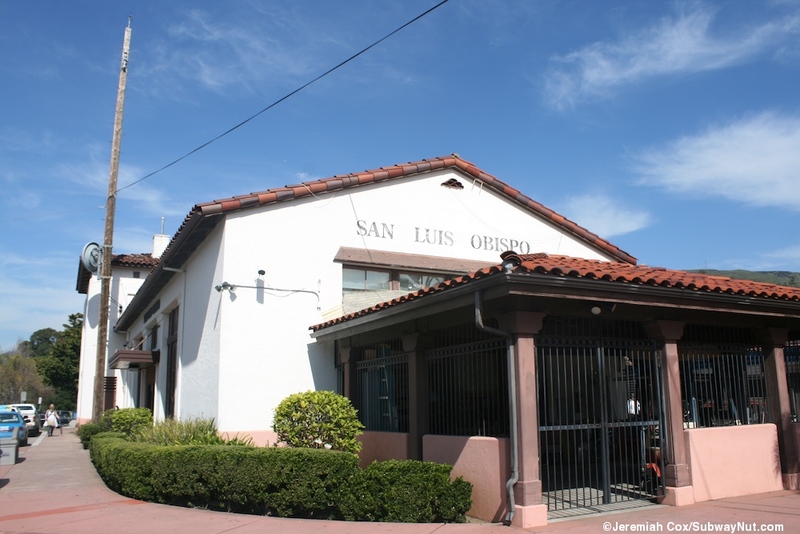 It is currently being renovated and restored into the San Lois Obispo Railway Museum.